Description: Fight in turn-based multiplayer battles up to 9v9 with the old school graphics you've been missing! Begin by journeying through any of the eight intense Trials, or play a friend in the free included Card Game, gaining gems and cards for use in The Arena. Then enter as a Warrior, Mage, Rogue, or Healer of either gender, and prepare for a turn-based multiplayer battle game like no other! Use gems to give yourself an element, and cast spells. Use cards to transform into any of 16 characters, combining their stats and abilties with your class's. Gain Charge during battle to do more damage, boost specific stats, and more; or just save your turns for later and pummel an enemy all at once-- all while chatting with the other players and audience, and jamming to a rockingly awesome soundtrack! Check out the site at 16bitarena.com for the trailer, how-to-play info, webcomic (updated weekly) and more! 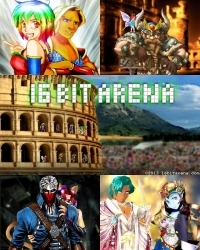 This is a list of VGCollect users who have 16 Bit Arena in their Collection. This is a list of VGCollect users who have 16 Bit Arena in their Sell List. This is a list of VGCollect users who have 16 Bit Arena in their Wish List.